In honour of Open Access Week, EUscreen releases an Open EUscreen portal, which advances the work on re-use executed in the project. Thanks to the enthusiastic responses from some partners, we’ve been able to develop this platform with selected content to stimulate creative re-use. On of the four corner stones of EUscreen is Re-use and Creativity: it was the topic of the second, Stockholm conference, was widely discussed in the status of online audiovisual heritage report and worked on in a series of workshops (Helsinki Remix and this year’s Open Knowledge Festival) under the guidance of our Finnish partners from the Helsinki Media lab. A significant milestone related to this topic is the production of an Open EUscreen portal, which advances the work on re-use executed in the project. Thanks to the enthusiastic responses from some partners, we’ve been able to develop and advance a separate EUscreen platform on Open Images. Open Images is an open media platform that offers online access to audiovisual archive material to stimulate creative re-use. Footage from audiovisual collections can be downloaded and remixed into new works. Open Images also provides an API, making it easy to develop mash-ups. The ‘open’ nature of the platform is underscored by the use of open video formats (Ogg Theora), open standards (HTML5, OAI-PMH) and open source software components. Furthermore, all software that is developed within the scope of Open Images will also be released under the GNU General Public Licence. 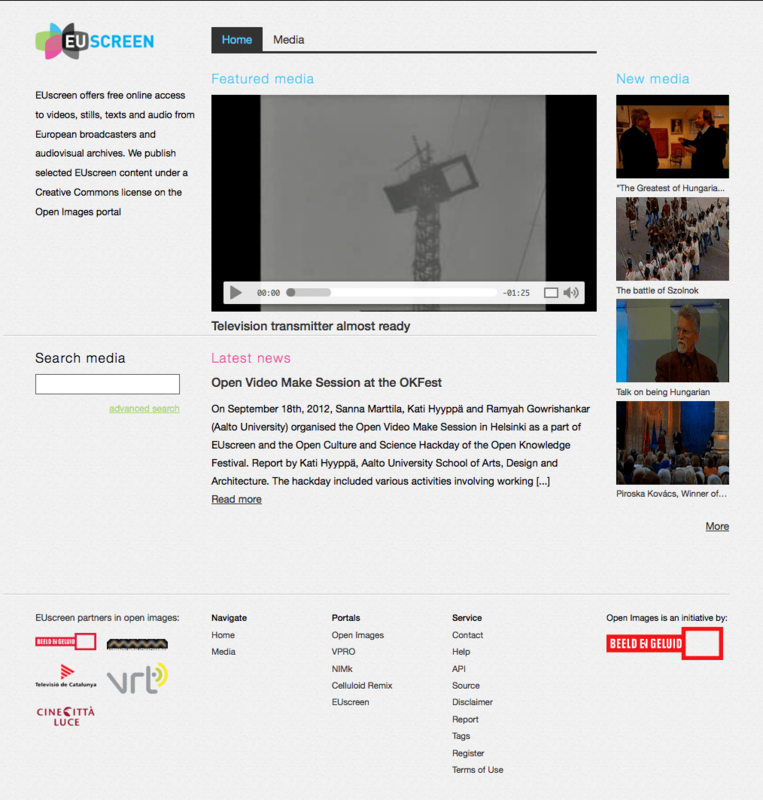 The site is accessible at http://euscreen.openimages.eu and was released to coincide with the Open Access Week. It features selected materials from EUscreen partners NAVA, Cinecittá Luce, VRT, Sound and Vision and TV3, who have made their materials available under a Creative Commons license. 58 videos have been uploaded and will remain available on this portal for reuse purposes. The reuse portal also receives a clear entry point on the EUscreen portal itself.